The image of Baymax's pudgy form busting out of his armour suit was one of the first we saw of Big Hero 6 - and now it's formed the basis of this neat bit of 3D printing. 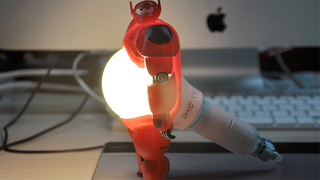 The design is by 3Denovo, a developing online marketplace for 3D printing designs, and replaces a 3D printed Baymax's belly with a lightbulb, creating a nifty lamp for your desk. Baymax himself is actually slightly poseable with articulation to turn his head, but the rest of the figure is a single piece of 3D printed material, designed to fold in half so you can fit a bulb (obviously one that's low wattage enough that you a) don't melt Baymax with the heat or b), Blind yourself with a lightbulb pointed right at you) into his middle. It's kind of amazing what you can do with 3D printing these days! Unfortunately 3Denovo haven't shared the files they used for the design, so even if you have access to a 3D printer to make one, you'd have to recreate it yourself if you want a personal lighting companion of your own. Boo.